Sumer, civilizatio Mesopotamiae meridianae, putatur locus ubi lingua scripta primum excogitata est, circa 3200 a.C.n. Tabula Kish, calx ex Sumer litteris pictographicis praedita; fortasse prima scriptura nota, 3500 a.C.n. Museum Ashmoleanum. Tabula legitima Babyloniana Media ex Alalah in involucro. Sequentia decem signorum civilizationus Indae prope septentrionalem Dholavirae loci Indi portam inventorum. Exempla signorum Jiahu, indicia sicut scriptura in testis testudinidarum, ex 6000 a.C.n. fere inventorum. Cippus Perusinus, scriptura Etrusca prope Perusiam Italiae. Incipium scripturae in abecedario Latino. Abecedarium Graecum primum in fictilibus in Museo Archaeologico Nationali Athenarum. Historia scribendi plerumque est evolutio linguae litteris aut aliis indicibus expressae ac huius progressus investigandi et describendi. 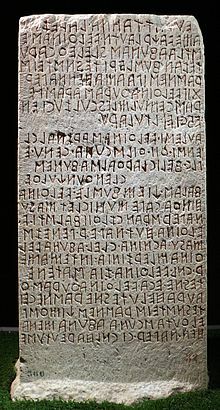 In historia modorum per quos systematum repraesentationis linguae modi graphicis factarum se in variis civilizationibus humanis evolverunt, pleniora systemata scribendi protoscriptura secuta sunt, systemata signorum ideographicorum et/vel mnemonicorum. Scriptura vera, in qua res in dicto linguistico contenta digeruntur ut alius lector exactum dictum scriptum mediocri subtilitatis gradu reconstruere potest, est progressus posterior. A protoscriptura distinguitur, quae grammatica vocabulorum et affixorum signa usitate evitat. Una ex primis expressionis scriptae formis notis est scriptura cuneiformis. ↑ "Symbols carved into tortoise shells more than 8,000 years ago . . . unearthed at a mass-burial site at Jiahu in the Henan Province of western China" (Li et al. 2003). ↑ Empires of the Plain: Henry Rawlinson and the Lost Languages of Babylon (Novi Eboraci: St. Martin's Press, 2003, ISBN 0312330022). Daniels, Peter T. 1996. The Study of Writing Systems. In The World's Writing Systems, ed. Bright et Daniels. Li, X., G. Harbottle, J. Zhang, et C. Wang. 2003. The earliest writing? Sign use in the seventh millennium BC at Jiahu, Henan Province, China. Antiquity 77:31-44. Millard, A. R. 1986. The Infancy of the Alphabet. World Archaeology 17(3):390–398. doi:10.1080/00438243.1986.9979978. Olivier, J.-P. 1986. 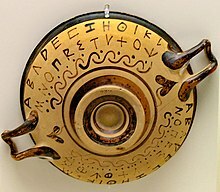 Cretan Writing in the Second Millennium B.C. World Archaeology 17(3):377–389. doi:10.1080/00438243.1986.9979977. Pilcher, Helen R. 2003. Earliest handwriting found? Chinese relics hint at Neolithic rituals. Nature, 30 Aprilis. doi:10.1038/news030428-7. Fischer, Steven R. 2005. A History of Writing. Reaktion Books. Glassne, Jean-Jacques. 2003. The Invention of Cuneiform: Writing in Sumer. JHU Press. ISBN 0801873894. Hoffman, Joel M. 2004. In the Beginning: A Short History of the Hebrew Language. Novi Eboraci: New York University Press. Voogt, Alex de, et Joachim Friedrich Quack, eds. 2011. The Idea of Writing: Writing Across Borders. Brill. Powell, Barry B. 2009. Writing: Theory and History of the Technology of Civilization. Oxonia: Blackwell. ISBN 9781405162562. Goody, Jack. 1986. The Logic of Writing and the Organization of Society. Cantabrigiae: Cambridge University Press. Nissen, Hans J., P. Damerow, et R. Englund. 1993. Archaic Bookkeeping. Sicagi: University of Chicago Press. ISBN 0500016658. Robinson, Andrew. 1999. The Story of Writing. Ed. 2a. Londinii: Thames & Hudson ISBN 0500281564. Saggs, H. 1991. Civilization Before Greece and Rome. Portu Novo: Yale University Press. Schmandt-Besserat, Denise. 1992. How Writing Came About. University of Texas Press. ISBN 0292777043. Schmandt-Besserat, Denise. 1992. Before Writing, Vol. I: From Counting to Cuneiform. University of Texas Press. ISBN 0292707835. Neugebauer, Otto, Abraham Joseph Sachs, et Albrecht Götze. 1945. Mathematical Cuneiform Texts. American Oriental Society et American Schools of Oriental Research. Smith, William Anton. 1922. The Reading Process. Novi Eboraci: Macmillan. Chisholm, Hugh. 1911. Writing. Encyclopædia Britannica: A Dictionary of Arts, Sciences, Literature and General Information. Cantabrigiae: University Press. Clodd, Edward. The Story of the Alphabet. Library of Useful Stories. cdli:wiki, Assyriological tools for specialists in cuneiform studies. Alphabet & protoalphabet the manifest of astrologic doctrine?.. Molla, Aberra. The Ethiopic Alphabet. Children of the Code: A Brief History of Writing. Pellicula videographica. Cracking the Maya Code. Noba. Public Broadcasting Service. De testis testudinum in Sinis inventis. BBC. Fragmenta fictilium in Pakistania hodierna inventa. BBC. Hieroglyphica Aegyptia circa 3000 a.C.n. BBC. Novissima mutatio die 11 Maii 2017 hora 16:07 facta.